"This is a declaration of war," Breitbart's John Nolte wrote in recently leaked internal chats from the right-wing website's editorial staff, revealing how they frantically attempted to deal with the fallout from an unwelcome fracas with Donald Trump's campaign last week. The avowed Trump-loving conservative news outlet has staked out a pro-Trump position so extreme it has cost them a reporter, a former editor and a spokesperson. Over the weekend, Breitbart reporter Michelle Fields finally resigned after the website refused to adequately back her up after she filed criminal charges against Trump campaign manager Corey Lewandowski for allegedly physically preventing her from asking Trump a question after a recent press conference. Some of Fields' colleagues immediately casted doubt upon her allegations and the site initially issued a weak-kneed call for the Trump campaign to apologize -- to no avail. Soon after, Breitbart spokesperson Kurt Bardella resigned, calling the outlet liars who "have been looking for a reason to disprove" Fields' story rather than stand up for her. "I do not believe Breitbart News has adequately stood by me during the events of the past week and because of that I believe it is now best for us to part ways," Fields said in a statement to Buzzfeed. Shapiro went further, calling Trump a "bully" and Lewandowski his "bully campaign manager." "Both Lewandowski and Trump maligned Michelle in the most repulsive fashion. Meanwhile, Breitbart News not only stood by and did nothing outside of tepidly asking for an apology, they then attempted to abandon Michelle by silencing staff from tweeting or talking about the issue," Shapiro said in a statement to Buzzfeed. Shapiro said Breitbart's attempt to suggest that Fields and a Washington Post reporter had misidentified Lewandowski was a "poorly-evidenced conspiracy theory," calling it the "ultimate indignity" that forced his resignation. "This is disgusting," Shapiro said. 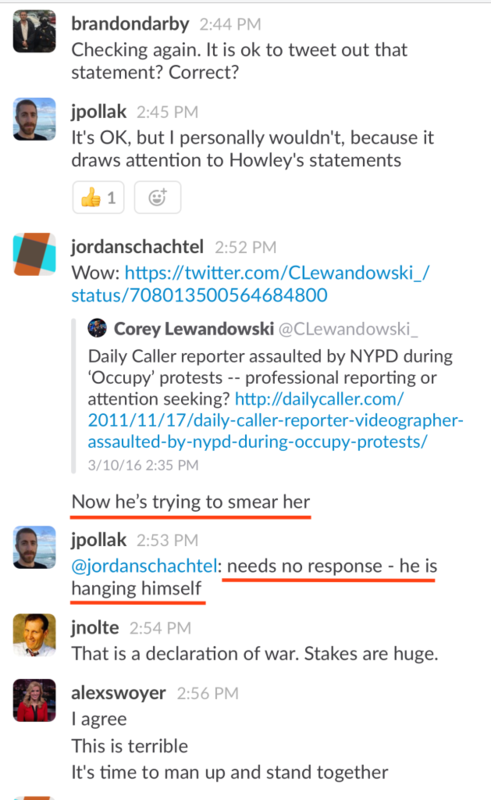 "No news outlet would stand for it." 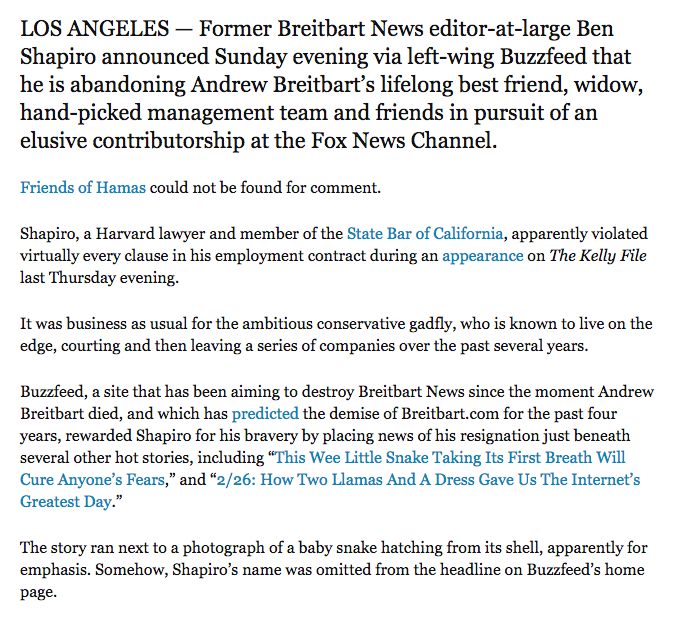 In response, Breitbart ran a piece on its homepage Monday with the headline "Ben Shapiro betrays loyal Breitbart readers in pursuit of Fox News contributorship." The piece was eventually removed but can still be found online. As Politico notes, Breitbart's response to Shapiro and Fields was posted by a William Bigelow, an apparent pseudonym for Shapiro's father David, who also resigned from the site over the weekend. "The fact they would use my father’s pseudonym in order to attack me just exposes how despicable they are," the one-time Breitbart editor-in-chief told Politico. "Breitbart put this under his byline because they knew I'd have to out him." Shapiro said the post linked to a site with his father's full name and address, which he claims is now outdated, in an attempt to doxx the family. Breitbart News Editor-at-Large and In-House Counsel Joel B. Pollak insisted the statement mentioning Shapiro's religion and placing his image within a yellow star was merely a harmless joke. "The article was written by me as part of an effort to make light of a significant company event, and was published as a result of a misunderstanding without going through the normal editorial channels," Pollack claimed in a statement published to replace Monday morning's.